Rosewater is a well-known beauty elixir, and we can bet you’ve had a bottle lying in your fridge at some point. But why is this elusive liquid so popular? In ancient Egypt, Queen Cleopatra, whose beauty is talked about even today, used to bathe in rosewater every day. And *spoiler alert*, the trend lives on even today. 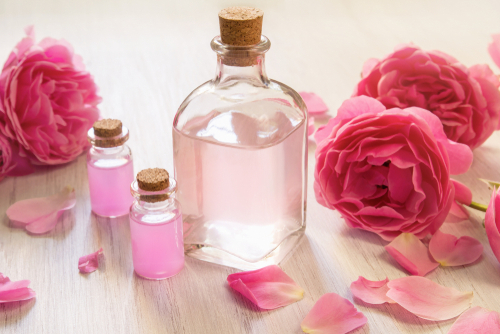 If you were to ask your grandmother, even she will attest to the beauty benefits of rosewater. For starters, it’s so versatile - it can be used for all skin types, and for a variety of uses. Besides that, it’s hydrating, rich in antioxidants and has anti-inflammatory properties. And the list doesn’t end there! Read on to find out why you need to grab a bottle for yourself right this second. Rosewater is the leftover by-product during the production of rose oil using rose petals. Some say that this is the ‘purest’ form of rosewater, while others feel that distilling rose petals with water also does the trick. Either way, the result is a clear, divine-smelling liquid. You can buy it from a store or make some on your own if you’re looking for something organic. If buying, make sure you skim through the list of ingredients at the back and avoid anything with added chemicals because those will do you more harm than good. Now that you have your precious beauty potion in hand, find out why you should be using it. Why Is Rosewater Good For Your Skin? The most important aspect of rosewater is its anti-inflammatory and anti-bacterial properties. This means that it can be used as a calming and a healing agent. Whether you’ve bruised your arm or are dealing with redness due to the heat, rosewater can cure it all! This is the reason why so many beauty products have rosewater listed as a major ingredient. Besides that, it is extremely hydrating and can unclog your pores, get rid of oil and grime, and balance your skin’s natural pH. You can even apply it to your hair to increase blood circulation on your scalp and to condition your hair, leaving you to touch and smell it obsessively all day. Don’t say we didn’t warn you! Read on to learn about the top 10 benefits of rosewater. Want the quickest relief for angry, irritated skin? Give yourself a generous spritz of rosewater. The beauty elixir’s anti-inflammatory properties will immediately calm and cool down your skin, leaving it fragrant and hydrated. In fact, some experts feel that rosewater is the best natural treatment if you’re suffering from skin issues like acne, rosacea or eczema. It is common knowledge that wrinkles and other signs of anti-aging are mostly caused by prolonged exposure of harmful UVA/UVB rays. While nothing can replace your sunscreen, antioxidants can help neutralise all the free radicals produced by sun damage, and help maintain your skin’s elasticity and youthfulness. If you have planned a long day of running errands in the sun, the sweat, dirt and oil can clog your pores and give you a serious case of acne. Rosewater’s antibacterial properties can gently clean your pores, ridding them of oil and dirt, and protecting your skin against any infections. So make sure you always have a tiny bottle handy! There’s a reason why rosewater is a very common ingredient in several moisturisers and facial creams- it’s a gentle, yet extremely hydrating moisturiser! To make things better, it doesn’t matter if you have oily, dry or combination skin- it can be used for any skin type because it is gentle, natural and loaded with benefits! If long hours at work and lack of sleep are making you look like a zombie, we’d first urge you to find a way to balance your schedule, because that lifestyle is extremely unhealthy and potentially life-threatening. While you do that, dipping some cotton pads into chilled rosewater and leaving it on your eyes will instantly refresh you, and reduce the swelling. Owing to its soothing properties, using rosewater to wash your hair can calm your scalp, and relive it of irritation after a hot, sweaty day. Besides that, since it’s an excellent moisturiser, it can condition your hair, leaving it soft and frizz-free. Rosewater’s most distinct quality is its intoxicating aroma, so why not ditch the heavy perfumes and spritz yourself with this scented water instead? Your pocket and your nose will thank you! Lazy girl tip: If you need a quick refresher during the day, but not enough time for a bath, wash your armpits with rosewater, and change your t-shirt. You’ll be smelling fresh as a daisy! Owing to it’s pleasant and refreshing aroma, the mere smell of rosewater can have an extremely calming effect on your nerves. There’s a reason why rose oil is often used in scented candles and room diffusers. If you don’t have either of the two handy, just douse a small towel in rose water and leave it over your head. It can relieve headaches and help you de-stress after a hard day’s work. Yes, you read that right. Besides applying rosewater topically to your skin, you can also ingest it to reap its many benefits. It is common to use rose in food and sweets in several cultures, including India. This is because it not only adds a unique flavour to the food but also calms down your digestive system. And we all know that a happy gut means a healthier you! Rosewater’s strong antibacterial and anti-inflammatory properties make it the perfect cure to relieve a sore throat. Moreover, several studies have shown that the magic potion can also relax irritated throat muscles, making it one of the best natural remedies for those suffering from throat problems. 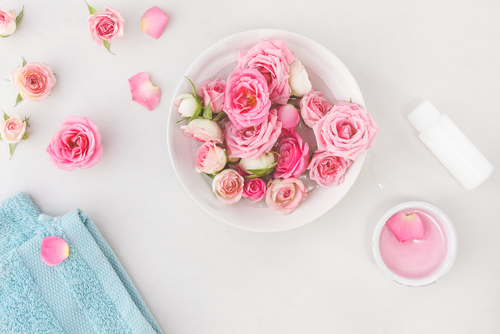 Now that you’re familiar with the never-ending benefits of rosewater, you’re probably wondering just how you can incorporate it into your everyday regime. Well fret not, we’ve listed down the top 10 most common uses of rosewater, and it will definitely change your life! You can thank us later. Start your day with a sweet cup of freshness in the form of some rosewater-infused tea. Not only will it give your morning an aromatic start, but the antioxidants in the tea will make sure your skin remains hydrated and supple all day long! We’ve already mentioned that rosewater has antibacterial and anti-inflammatory properties, which will work well to cleanse your mouth in the mornings. Some studies have also shown that the calming agents in rosewater can help soothe mouth sores and ulcers. Plus, you’ll have rosy breath, which is always a plus! Most toners are alcohol-based, and therefore, harmful for sensitive and acne-prone skin. A cotton ball soaked in rose water, however, can work well to purify your pores, hydrate your skin, calm redness and give it a dewy glow. Looks like it’s time to throw out all your alcohol-based toners! Sure, everyone loves bathing with delicious smelling body washes and spriting yourself with a perfume later, but great smelling clothes will make sure you smell *extra nice*. All you need to do is add some rosewater to you odour-less detergent, or just replace the water in your iron with it! Face masks act as a luxurious treat to your skin and are super relaxing too! Amplify any mask’s hydrating effects by adding a few fragrant drops of rosewater to it. Once you try this, you’ll never go back to adding just water to your masks. Removing your makeup at the end of the day is the most important thing you need to do for your skin. However, a lot of makeup removers in the market are full of harsh chemicals that can harm your skin and sting your eyes. If you’re looking for a ‘natural’ solution, just mix rosewater with some coconut oil and say hello to clean, makeup-free skin! If you are looking for a natural, refreshing spritz, for your face or body, look no further. Just pick up a rosewater spritz from a store, or make your own at home by mixing two parts rosewater with distilled water in a sanitized spray bottle. Spritz away! Long day at work? Rose water can help you calm your tired joints as well as your nerves. So treat yourself to a comforting bath- add a few drops of pure rose water to your tub and soak yourself in a fragrant pool of the magic potion a la Cleopatra! Caution: You wouldn’t want to leave the bathtub after this! Most drugstore shampoos and conditioners in the market contain harmful sulfates and other chemicals. Go the natural way and treat your tresses a gentle rinse of rosewater. It will help remove the extra product from your hair, add a boost of shine and body to it while leaving it silky. Want to try rosewater-based products but don’t know where to begin? We’ve got you! Scroll below to check out our list of the best rosewater products you can get your hands on. Staying inside air-conditioned offices all day can dry out and irritate your skin. If you’re looking for a toner to refresh and hydrate your face in the middle of the day, this toner will definitely do the trick. Saturate a cotton pad with the product, or if that’s too much of an effort for you, transfer it to a spray bottle! Sometimes plain rosewater won’t do the trick when it comes to removing dirt and grime. However, you can trust a rose-based facial cleanser to do the job. This one by Kama Ayurveda also contains jasmine, which doubles the floral power. This one’s specifically for days when you’re wearing heavy makeup and need a double to cleanse because a normal cleanser won’t remove stubborn mascara or matte lipstick. Pro tip: Use the micellar water first to remove makeup, and for extra rose goodness, follow it up with the rose-based Kama Ayurveda cleanser listed above. Want to add some rosy goodness to your lips? Try this luxurious lip balm by forest essentials, that contains fresh rose petals dipped in honey. Your lips will remain soft and hydrated all day! The harsh soaps we use to wash our hands after frequent trips to the restroom tend to leave them uncomfortably dry! This will also make the skin on your hands rougher and wrinkly over time. To avoid that, make sure you use a moisturising hand cream every time you wash your hands. This one my The Face Shop contains rosewater and smells delightful. 1. Can I Make Rosewater At Home? Yes! Not only you can absolutely make rosewater at home, but you can also do it at half the price of store-bought ones. And who doesn’t love a good deal? All you need is some fresh roses and some distilled water. You can use a ration of 6-7 roses with 1.5 liters of distilled water. Pluck the petals off the flower and wash them with warm water to remove dust or other particles. Once that is done, add the petals and water to a kitchen pot, cover it with a lid and let it simmer over medium heat for around 20-30 minutes. Once the petals become paler and lose their colour, strain the liquid and store it in a bottle. Your rosewater is ready! 2. 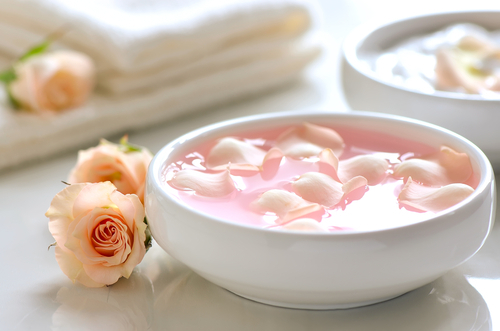 Can Rosewater Brighten Your Skin? Firstly, we don’t want to encourage skin lightening of any kind. Your complexion is beautiful just the way it is, and you should stay away from chemicals promising to lighten it. However, if your skin is dull and lifeless and you want to make it bright and glowy, then yes, rosewater will do the trick! The antioxidants in rosewater will fight free radicals that cause dark spots while its anti-inflammatory properties will reduce redness. If you want an added brightening effect, mix rosewater with honey and lemon to make a DIY face pack! Proceed with caution though, because this mixture is so yummy that you might be tempted to lick it off! 3. Is Rosewater Safe To Drink? Rosewater has been traditionally used in plenty of drinks in India and abroad. You can use it to make rose tea, mix it with milk or even use it to make cocktails! The choice is yours- just make sure you’re not allergic to it. Just use your common sense, use only pure rose water for consumption. Don’t accidentally mix your facial rose toner in a drink, as it might contain additional ingredients not safe for consumption. 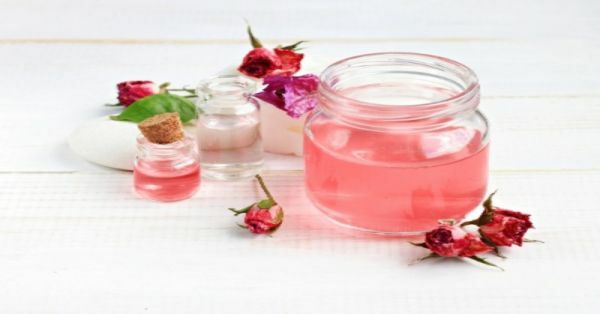 Make your own rosewater to be on the safe side! 4. Can I Cook With Rosewater? Of course! If you can drink it, you can certainly add it to your food! In fact, you’ll realize that a lot of traditional Indian sweets contain this magic ingredient- rasmalai, rasgulla, gulab jamun- you name it! 5. Are The Any Side Effects Of Using Rosewater? If we’re talking about 100% natural rosewater, then unless you’re allergic to it, you won’t encounter any side effects. To make sure you’re not allergic, do a patch test on your elbow before you use it anywhere else on your body.